Feb 1-3 Kiwi Nash Hash Hosted in the happy town of Hammer Springs, New Zealand. Feb 1-3 Campout Hosted by the Manila Mixed H3 near Mabalacat, Philippines. Feb 9-11 Inaugural Outstation Weekend Hosted by the Nay Pyi Taw H3 in Bagan, Myanmar. Feb 14-17 Red Dress Weekend Hosted by the Other Orlando H3 in Orlando, FL USA. Feb 15-17 Javea Hash Weekend Hosted by the Coast Blanca H3 & Madrid H3 in Javea, Spain. Feb 22-24 Party Gras Hosted by the Tuesday, Tuesday, Tuesday H3 in Virginia Beach, VA, USA. Feb 22-24 AGM Hosted by the Hillbilly H3 in Bentonville, VA, USA. Feb 23-24 9th Analversary Hosted by the Mutha Rucker H3 near Coffee Springs, AL, USA. Feb 28 - Mar 2 InterGulf 2019 & 40th Anniversary Hosted by the Desert H3 in Dubai, U.A.E. Feb 28 - Mar 3 2th Fairy Memorial Green Dress Run Hosted by the Savannah H3 in Savannah, GA, USA. 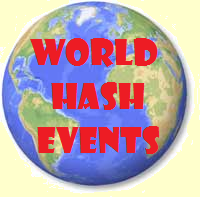 Feb 28 - Mar 4 Philippine Nash Hash Hosted by the Manila H3 in Manila, Philippines.